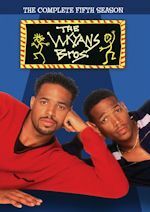 It may be April Fool's Day, but we're not foolin' because Logo is adding more sitcoms! The Viacom shuffle is continuing with more borrowing of shows. In the latest round of shuffling, Roseanne is headed to Logo. Currently, Roseanne is on Viacom-owned networks CMT and TV Land, but the CMT airings will be moving to Logo effective immediately. This means that CMT will now only have Reba as a sitcom, since Yes, Dear has been gone too, as it moved to Nick Jr. recently (and still airs late nights on sister network Nick at Nite). Roseanne will remain airing on TV Land in weekend play like it has been airing. Logo will actually begin the series beginning today (Monday, April 1) - no foolin'! It will air from 4-6pm and air most weekdays in the afternoon along with some weekend airings. Also coming to Logo will be The Golden Girls! That series just started a few weeks ago on TV Land and has thrived in the ratings (already being expanded to weekdays 6-9pm instead of the planned 7-9pm). 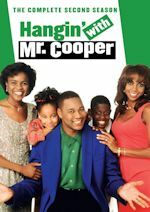 Now Viacom will add more airings of it on another sister network, with it airing on Logo as well. The Golden Girls premieres Saturday, April 13 with a weekend marathon beginning 1pm (following a block of Roseanne) and ending at 1am. As for regular airings, The Golden Girls will be asked to air on most weekdays in the early evening/primetime timeslots, along with weekend play in those dayparts. While we get two new sitcoms on Logo, one sitcom that was airing will be heavily reduced. In fact, it just has one scheduled airing in the near future. Bewitched, which was added back in October on Logo, will now be heavily reduced big time. 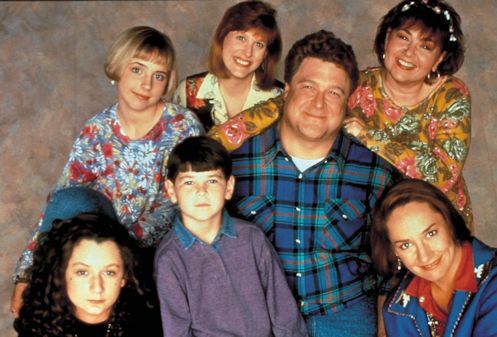 As of now, only one airing is scheduled on Thursday, April 11 at 6pm, following a block of Roseanne. Hopefully we will see more Bewitched soon, and we will let you know if it comes back into more regular airings like it has been airing since October. Elsewhere in Viacom land, TV Land has made a few minor schedule changes that concern a show we just mentioned. As just mentioned, The Golden Girls has been expanded on weekdays from 6-9pm, so The Cosby Show 6-7pm hour is off and the series will air on weeknights from approx. 3:30am-5am now (in addition to its weekend blocks during the day). And finally, Viacom-owned TV Land will add even more The Golden Girls on weekends with Saturdays 4-10am being added effective this coming Saturday (April 6). 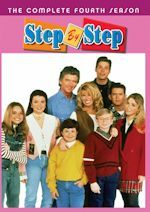 The series will replace Three's Company, which goes on hiatus again. The sitcom was doing very well in the ratings, especially in the younger demo of 18-49, but the series is nearing its end on its current contract (which expires at the end of August), so they're trying to save some more plays on episodes. We hope Jack Tripper and the rest of the company return soon, like they always do. Stay with us for continued updates on Logo, TV Land and other Viacom-owned networks! Our friend Chris Mann has just posted two more episodes of his retro podcast "Reimagine That!" and you'll want to hear this! In fact, we're even mentioned on the second episode with Chris relaying some of our recent Seven Questions interviews, including Amy Davidson, Haywood Nelson and Beverly Archer (don't forget to read our interview we just posted last week with Nicole Eggert). We thank him and we strive to be as good as him in his flawless podcast, produced by him and the great Linda Kay. In his latest episodes, he heads back to Dallas with a star from the original series. 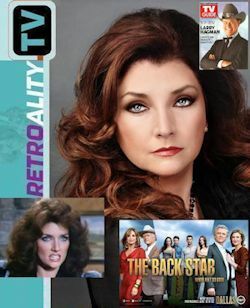 In the first of her two-part exclusive Retroality.TV interview, child star-turned-Dallas diva Morgan Brittany tells "Reimagine That!" host Chris Mann about the possibility of returning to Southfork -- in TNT's hot revival of the legendary soap -- as primetime's original queen of mean, Katherine Wentworth. Morgan discusses various ways she could re-enter the Dallas scene, and reveals how she developed the wicked Wentworth during her original stint on the CBS hit. 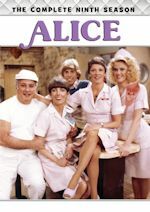 After a successful run as a child actor in the 1950s and 60s -- she worked with the likes of Henry Fonda, Lucille Ball, Natalie Wood, a young Ron Howard and Alfred Hitchcock -- the former Suzanne Cupito shares what drove her to abandon that name and identity in favor of reinventing herself in the 1970s as Morgan Brittany. And in part two, she tells host Chris Mann how her hardships as a child actress and her family's breadwinner shaped her as a woman who not only would survive Hollywood (including Dallas' ill-fated dream season) but also hold her own as a conservative political columnist and host. And she's juggled multiple careers while raising two children with longtime husband and stuntman Jack Gill. Their son, Cody, is a musician and their daughter, Katie, is an actress (most recently seen playing Christie Brinkley's daughter in NBC's Parks and Recreation). Wow, you'll hear all that good stuff and more! Chris also gives an update on his upcoming projects, including an updated version of his Three's Company book Come and Knock On Our Door and a book on the late, great John Ritter. And as always, dream weaver Yvonne Ryba does the "Reawakenings" segment and analyzes two more dreams. So head on over to Reimagine That! and listen away to episodes 17 and 18!